The pieces that I made with Dieu Donné are part of a larger project exploring the principles of crystal formation through artworks that are both didactic and abstract. This project is inspired by the innovations of radical 19th century pedagogue Friedrich Froebel: crystallographer, designer of teaching toys, and esoteric dreamer. The paper forms are illustrations of eight different crystals: helvite, malachite, azurite, boracite, parisite, tungtupite, axinite and zinkinite. Each piece can be folded to create a three-dimensional geometric model of one of the seven crystal systems – triclinic, monoclinic, orthorhombic, tetragonal, trigonal, hexagonal, isometric – that corresponds to the given crystal form. Their colors and textures are interpretations of each crystal’s “habit” or attributes. 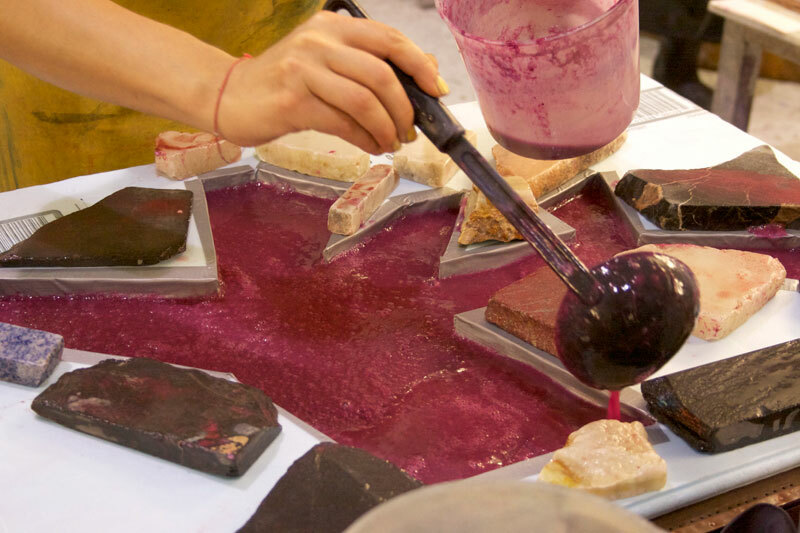 Because each crystal type can come in a range of colors and textures, we experimented with a variety of techniques to mimic these. For the metallic luster of zinkinite we used metal leafs, dry pigments, and rust. To capture the luminosity of boracite we layered sheets of translucent abaca. The density and color saturation of malachite and azurite required thick cotton with liquid dye poured directly onto it. 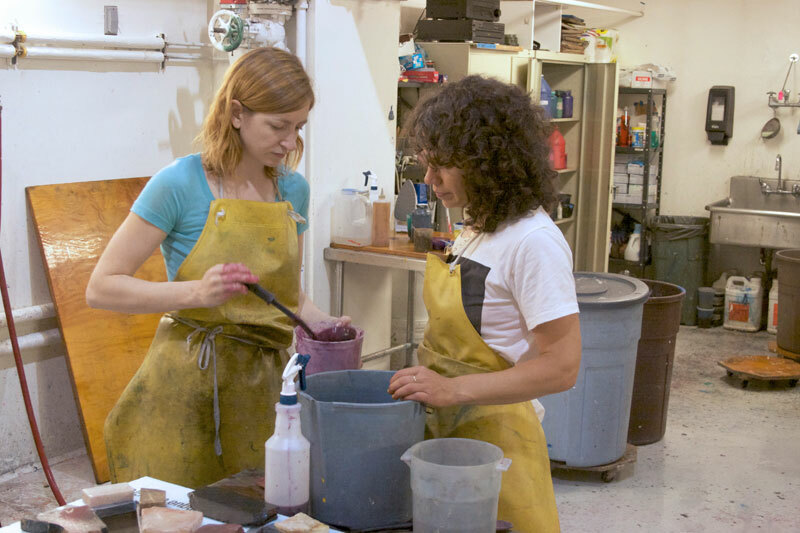 Collaborating with Lisa Switalski was a continual conversation and experimentation with how to translate the material processes of one chemical phenomenon (geology) into the creation of a new one (papermaking). Her encouragement and assistance with moving between experiment and accident gave new insight into my ongoing interest in engaging the artistic medium as a key conceptual determinant of each piece. Like rocks, paper is a mixture of dry and aqueous solutions taking form through processes of compression and expansion to create outcomes that are both predictable and surprising. It is rare that I allow the process of physically making a work to direct its form. It was both a challenge and gift to have the opportunity to do so during my residency at Dieu Donné. 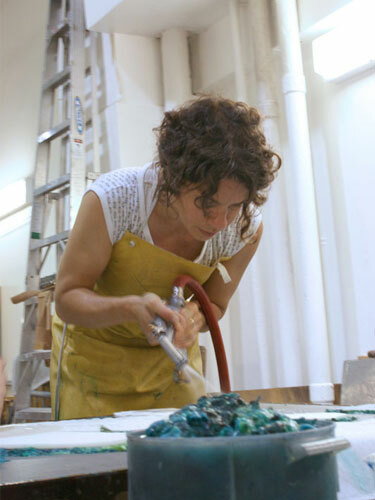 Anna Craycroft lives and works in New York, New York and is represented by Tracy Williams, Ltd.